Purpose: To provide dental hygiene students with a service learning opportunity to work with special needs and culturally diverse underserved populations through the Oral Health on Wheels (OHOW) community based mobile dental hygiene clinic. Methods: A student feedback survey was administered between the years of 2009 and 2013 to 90 students in order to gather and identify significant satisfaction, skills acquisition and personal growth information after the student's clinical experience on the OHOW. ANOVA and Pearson correlation coefficient statistical analysis were utilized to investigate relationships between student responses to key questions in the survey. Results: An analysis of 85 student responses (94.44%) demonstrated statistically significant correlations between student learning and their understanding of underserved populations, building confidence in skills, participation as a dental team member and understanding their role in total patient care. The strong correlations between these key questions related to the clinical experience and students confidence, skills integration into the dental team, and understanding of both total patient care, and the increased understanding of the oral health care needs of special populations. All questions directly link to the core mission of the OHOW program. Conclusion: The OHOW clinical experience allows dental hygiene students a unique opportunity to engage in their community while acquiring necessary clinical competencies required by national accreditation and providing access to oral health care services to underserved patients who would otherwise go without treatment. There have been many well-established reports regarding the education of oral health care providers within educational institutions.1,2 One most notable report in 2003 from the American Dental Education Association's (ADEA) President's Commission details the roles and responsibilities of academic dental institutions.3 In that report, authors draw attention to the significance educational institutions have in becoming part of the “moral community,” helping not only improve access to oral health care, but to “be able to influence state and federal policy makers, community leaders, industry, and other stakeholders to help the profession fulfill its moral duties.”3 A critical concern in this ADEA report was meeting the oral health care needs of our changing demographic society including underserved and culturally diverse populations. The Commission on Dental Accreditation (CODA) standards clearly identify that students graduating from dental/dental hygiene institutions must be competent in managing a diverse patient population and have the interpersonal and communication skills to function successfully in multi-cultural work environments (Standard 2.17), and that they are competent in assessing the treatment needs of patients with special needs, (Standard 2.12).6 Therefore, if educators implement strategies to expose students to diverse patient populations, those students may view working with these patients as a rewarding experience and be better prepared to treat them in the workforce. Three main goals of service learning used in dental educational settings have also been described by Hood.12 Improving student learning, promoting civic engagement and addressing social needs are all crucial to a successful service learning project in addition to strengthening the community at large. Other key components include reciprocation between the students and the community entity being served. Reflection by the student is also crucial to a successful learning experience.12 Elyer and Giles discuss the importance of matching the academic goals with the placement of students in the community setting in addition to student reflection as a way to deepen the transfer of knowledge learned in the engagement.13 Other important pieces noted by these authors include the students' relationship with the community partner, the time or duration of the experience and the student's perception of the quality of the service learning experience.13 The Commission on Dental Accreditation (CODA) evaluates the dental institutions' ability to make sure students are culturally competent; therefore, implementing service learning opportunities in the dental hygiene curriculum is an effective way to ensure this outcome. 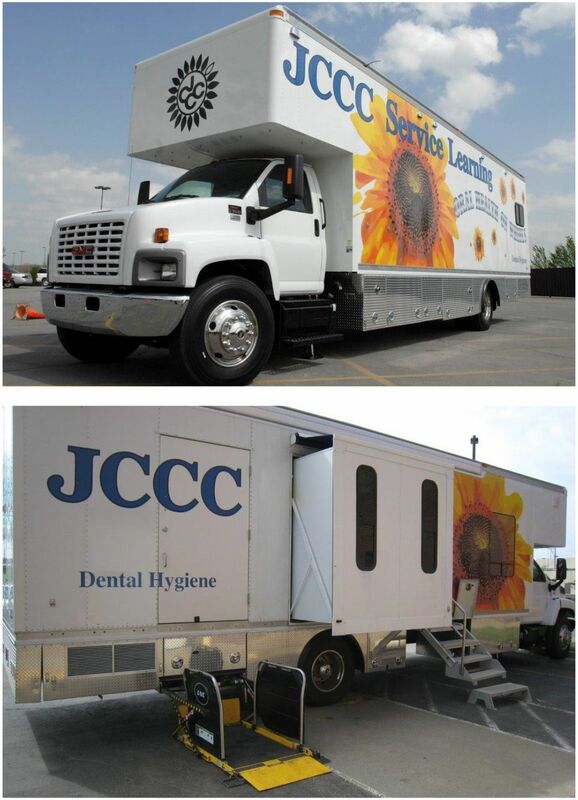 As an innovative approach to dental hygiene education and public health, a service learning outreach clinic called, Oral Health on Wheels (OHOW) began full operation as a clinical rotation for dental hygiene students at Johnson County Community College (JCCC) in August, 2008. Following successful capital fundraising and college commitment towards ongoing operating expenses, a mobile dental hygiene vehicle was purchased to implement this service learning program (Figure 1). The mobile dental hygiene clinic is a 43 foot custom designed truck (LifeLineMobile®) outfitted with 2 complete dental operatories, sterilization area, patient intake, waiting room and a wheel chair lift. Clinical rotation on the OHOW allows dental hygiene students to participate in, and provide the full scope of dental hygiene services to culturally diverse patients and those with special needs. The OHOW continues to be fiscally supported by the college and is therefore maintained as an enriching clinical experience for the dental hygiene students. Operations of the OHOW are monitored by a full-time dental hygiene faculty who is the project coordinator. Additionally, community dentists are employed to enhance interprofessional education.12,13 Second year dental hygiene students spend a 3-week rotation in the OHOW as part of their clinical instruction. A 1:1 faculty-student ratio on the OHOW allows for extended learning and assistance with new patient experiences with special populations served by OHOW (Table I). The OHOW partners with 2 Johnson County service agencies including Johnson County Developmental Supports (JCDS) and Johnson County Department of Health and Environment (JCDHE). A third partnership is in place with an outreach center, Center of Grace. Clients from JCDS are diagnosed with mild to severe intellectual and developmental disabilities. Patients seen at JCDHE are pregnant mothers while Center of Grace clients are predominantly Hispanic adults. Table II describes the demographics of these community partners. Eligibility of consumers are determined by the JCDS Director of Clinical Supports. Appointment scheduling is maintained by nursing staff using a re-care system prescribed by OHOW staff to benefit clients' periodontal health. Wednesday treatment alternates between JCDHE and Center of Grace outreach center. Clients at JCDHE are informed of the health benefits and provision of oral health services provided on OHOW through an internal intake system by WIC coordinators and nurse practitioners. Clients are then scheduled for a screening by the bilingual social workers in order to begin treatment as most of the clients served are Spanish speaking. Clients at Center of Grace are given appointments on a first come first serve basis. These patients continue care if they are still enrolled in ESL classes at the center. Supervision of the OHOW mobile clinic is conducted by a full time dental hygiene faculty from the college. A community pool of dentists make up the staff dentist position on the OHOW. One dentist is on the mobile unit during each rotation. Two dental hygiene students rotate through the mobile dental clinic at one time, twice per week. The same dentist maintains the staff position every Monday, serving clients at Johnson County Developmental Supports (JCDS). The consistency of the same dentist on site with the special needs population strengthens the acceptability and comfort level for the patients. Currently, 5 remaining dentists rotate to fill the Wednesday staff dentist position participating from 1 to 5 days per semester. This community pool of dentists strengthens the relationship with the local dentist community and shares the learning experiences the college offers the dental hygiene student. In order to facilitate the cross-cultural bridge with the Spanish speaking community, an experienced interpreter/translator completes the OHOW team. As an integral part of the OHOW mobile clinic, the interpreter assists Spanish speaking clients with completion of forms, and referrals (English/Spanish), understanding treatment findings and needs, oral health care instruction, scheduling and post-treatment follow-up. The literature is clear that dental hygiene education is a conducive platform to providing students with valuable service learning experiences as an avenue for creating community partnerships.2,14 Therefore, the purpose of this service learning project was to provide dental hygiene students a unique opportunity to gain meaningful patient care experiences with special needs and culturally diverse underserved populations through a mobile community based clinic. In addition, this study evaluated student satisfaction with their experience on the OHOW rotation through a student feedback survey. Students participated in the OHOW rotation 3 weeks at a time, 2 times per week. Prior to participation, students review and complete a series of modules on “Practical Oral Care for People with Developmental Disabilities.”15 Students also complete a take-home exam on this information thereby increasing their ability to work with and treat patients with special needs and those from underserved populations. In order to evaluate student satisfaction of the OHOW service learning project, a Student Feedback Survey was administered to all students who participated in the project over the 5 years from 2009 to 2013. The survey was administered at the culmination of the second year, prior to graduation, giving the students time to reflect on their service learning experience. The survey was blind and consent was given by participation. A total of 90 students completed the survey from 2009 to 2013. Completion of the survey was not required. The survey measured the degree to which OHOW increased student awareness of underserved populations, cultural diversity, clinical skills, confidence building, dental team working relationships and the delivery of ethical patient care. Students also provided open ended feedback about current program operations and the degree to which the rotation may have influenced their clinical dental hygiene education as well as future professional endeavors. In this way, the survey assessed both quantitative and qualitative feedback. The Feedback Survey was adapted from one used in a study by Ashton-Brown et al, where the authors evaluated the use of public health clinics in a service-learning rotation for dental hygiene students.16 That survey was originally modeled after the Health Professions Schools in Service to the Nation program taken from the handbook Methods and Strategies for Assessing Service-Learning in the Health Professions.17 The final adaptation of the survey in this study included a total of 25 questions. These 25 questions were broken into 3 sections. The first section included 10 questions pertaining to skill development with a 5 point Likert scale answer ranging from 1=not at all, to 5=very much. The second section included 11 questions relating to the students' experiences on the service learning rotation. The Likert scale in this section ranged from 1=strongly disagree to 5=strongly agree. Lastly, section 3 included 4 questions for students to provide reflection on things they learned, might change, advice for the project and any comments they would like to share with the faculty and staff about their service learning experience. In order to assess the student's learning strategies while on the OHOW rotation, student's conferenced with the program director at the end of each rotation. Students provided reflection regarding their triumphs, progress and opportunities for clinical skill improvement based on their performance. Progress evaluations were also submitted to the Second Year Lead Clinical Coordinator(s) of Clinic III and IV for consideration during clinic course conferences which served as additional reflection. Out of the 90 students who responded to the survey, 85 (94.44%) indicated satisfaction and personal growth after their clinical experiences on the OHOW rotation. These responses provided valuable feedback for any changes in the curriculum related to intellectually and physically disabled populations. Students reported significant satisfaction, personal growth and confidence while working with clients with intellectual and developmental disabilities (p≤0.05). The JCDS service site was repeatedly favored by the dental hygiene students. Additionally, students expressed how the OHOW rotation exceeded their clinical expectations and personal satisfaction in treating clients with special needs. The survey also ascertained the degree to which the OHOW experience enhanced the students' dental hygiene education in working with diverse, underserved, multicultural and special needs populations. Table III shows the Pearson correlation of students' responses to key questions asked on the survey. Students expressed a significant level of satisfaction in many domains. Responses demonstrated strong correlations between student learning and their understanding of underserved populations (r=0.504), building confidence in skills (r=0.645), participation as a dental team member (r=0.586), and understanding their role in total patient care (r=0.545) (Table III). The strong correlations among these key questions related to their clinical experience and confidence, skills, integration into the dental team, and understanding of both total patient care, and their increased understanding of the needs of special populations. All of these items speak to the core mission of the OHOW program. Students also responded favorably to the advanced challenges presented in case treatment. Comments consistently reported a favorable learning environment and skill acquisition in the mobile facility. Students also reported significant satisfaction with their experience working as a team of professionals in order to treat the underserved populations on the OHOW facility. The Johnson County Community College survey demonstrated a high satisfaction with the ability of the OHOW rotation to enhance the dental hygiene students' ability to provide dental hygiene care. Student comments included, “challenging, but a good experience,” “by far my favorite rotation site” and “I wish I could have been on the truck all the time, I learned so much.” This feedback is essential in order to continue to provide each student with an authentic learning environment, while meeting the needs of each service center. Several key questions are noted regarding the treatment of underserved populations learning, working as a team, and serving patients without discrimination. Table IV demonstrates student responses to these key questions. It highlights student responses to working with underserved populations, learning more skills, working as a team and learning the value of serving patients with special needs. There was a major increase in the student's perceived ability to learn more skills during their rotation on the Oral Health on Wheels service learning project. The faculty and administration at JCCC are committed to implementing and continuing service learning projects in the dental hygiene program. Students positive response to their OHOW service learning experience, support the mission of the educational arm of the dental hygiene program and the mission of OHOW. The strong correlations identified in this service learning evaluation project may be in part due to the unique environment in which learning takes place. Students are encouraged and directed by all faculty and staff, on how to use their knowledge and skills to deliver exceptional patient care while continuing to sharpen their professionalism. Elyer and Giles suggest that a crucial component of an effective service learning project is connecting the academic goals with the placement of students in the community setting, further deepening engagement.13 The outcomes of this study demonstrated this suggestion by these authors. Students' perception of the OHOW rotation were favorable showing high satisfaction in their feedback demonstrating the experience to be valuable both personally, for their clinical skills, and impacting their sensitivity to underserved populations. A unique hallmark of service learning in dental hygiene is how the community partner benefits from the service provided.9 Patient surveys are shared with students as part of the student feedback process and reflection, allowing the students to see the direct impact and appreciation clients express after receiving oral health care services from the OHOW project. As part of the national oral health care objectives, working as a team to reduce the burden of oral disease is seen as an integral part to promote health and quality of life for all individuals.4 As educational institutions change the delivery of dental education for future health care professionals, it is hypothesized that the changes may produce oral health professionals with a renewed dedication to reach out to underserved populations. Long term data continues to be collected on the OHOW project and will be valuable in assessing the future impact of the service learning from both the student and community partner perspective. Follow-up study should include information from graduates to assess how the project impacted their choice of employment in public health clinics. Additionally, future plans include utilizing an Advanced Education in General Dentistry resident on the OHOW rotation 1 day per month to collaborate with the students and patients as well as reduce the burden of care in underserved populations. The main purpose of the OHOW project was to evaluate its' impact on student satisfaction and their ability to gain valuable clinical experiences treating underserved populations. The results demonstrated the OHOW project was able to meet its stated purpose as students were highly satisfied. Rotation on the OHOW increased student learning and understanding of underserved populations, built confidence in their clinical skills, increased their participation as a dental team member, as well as their understanding of their role in total patient care. Lastly, results from this study support the ADEA Commission on Dental Education recommendations for improving the oral health for all Americans. The OHOW service learning project allows dental hygiene students a unique opportunity to engage with their community while acquiring necessary clinical competencies required by national accreditation and providing access to oral health care services to underserved patients who would otherwise go without treatment. Heather Flick, RDH, MS, MPH, Professor, Department of Dental Hygiene, Johnson County Community College. Project Coordinator, Oral Health on Wheels. Sheri Barrett, EdD, Director, Outcomes Assessment, Johnson County Community College. Carrie Carter-Hanson, RDH, MA, EdD, Director, Department of Dental Hygiene, Johnson County Community College.
. A National Call to Action to Promote Oral Health. U.S Department of Health and Human Services, Public Health Service, Centers of Disease Control and Prevention, and The National Institutes of Health, National Institute of Dental and Craniofacial Research. NIH Publication No. 03-5303, May, 2003; Rockville, MD.
. Improving access to oral health care for vulnerable and underserved populations. 2011; Washington, DC: The National Academies Press.
. Improving the oral health status of all Americans: roles and responsibilities of academic dental institutions. The report of the ADEA President's Commission. J Dent Educ. 2003; 67(5):563-583.
. (2012). U.S. Department of Health and Human Services: Office of Disease Prevention and Health Promotion:Healthy People 2020 Nasnewsletter (2002/05/04 ed., Vol. 15, p. 3): U.S. Department of Health & Human Services.
. Dental education and changing oral health care needs: disparities and demands. J Dent Educ. 2012; 76(1): 75-88.
. Accreditation Standards for Allied Dental Hygiene Education Programs: Chicago. American Dental Association, April, 2013.
. Emerging allied dental workforce models: considerations for academic dental institutions. J Dent Educ. 2007; 71(11):1476-1491.
. A framework for service-learning in dental education. J Dent Educ. 2006; 70(2): 115-123.
. Service-learning: community–campus partnerships for health professions education. Acad Med. 1998; 73(3):273-277.
. Situated cognition and the culture of learning. Educational Researcher. 1989; 18(91): 32-42.
. Service-learning in dental education: meeting needs and challenges. J Dent Educ. 2009; 73(4): 454-463.
. Where's the learning in service-learning? 1st ed. San Francisco: Jossey-Bass; 1999.
. Dental hygiene education about patients with special needs: A survey of U.S. programs. J Dent Educ. 2008 Sep; 72(9): 1010-9.
. Utilizing public health clinics for service-learning rotations in dental hygiene: a four-year retrospective study. J Dent Educ. 2009; 73(3): 358-374.
. Methods and strategies for assessing service-learning in the health professions. San Francisco: Community-Campus Partnerships for health, 1999.
. Introduction to the Macy Study Report. J Dent Educ. 2008; 72(2S): 5-9.
. Dental students' experiences with and attitudes toward people with mental retardation. J Am Dent Assoc. 2004; 135: 353-357.
. Service learning and dental hygiene: A literature review. J Dent Hyg. 2007; 81(3): 1-10.
. Extending oral health care services to underserved children through a school-based collaboration: Part 1-A Descriptive Overview. J Dent Hyg. 2011; 85(3): 181-192.